T3 recently flew to southern Spain to drive the seventh generation of BMW’s popular 5 Series. The new model features plenty of new technology making it the most advanced car BMW has ever created (outside of the i range). That’s exciting, because traditionally car manufacturers have introduced new technology in their largest, most expensive vehicles, and as economies of scale slide, and the tech becomes cheaper it filters its way down to less expensive models. But now, the smaller, more affordable 5 Series has become the BMW’s flagship model for technology, and that means we’ll start to see car tech developing at an even faster rate than it has in the past. 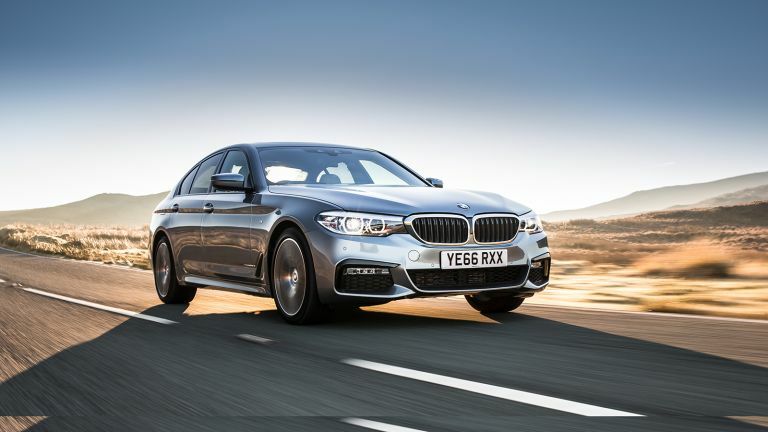 The previous generation wasn’t too shabby when it came to features, but the latest 5 Series is a technical tour de force, in fact it can now rival more luxury cars, such as the Audi A7, Mercedes S-Class, and even BMW’s own 7 Series. The whizz-bangery starts before you even climb in the car. The smart key fob features a touchscreen, allowing you to remotely drive the car forwards and backwards. Does it make you feel like James Bond? No, not really, it’s quite slow, but it is useful for getting in and out of a tight garage (and showing ff to your mates). During remote operation all of the obstacle avoidance systems are still in tact, so you can’t remotely plough it into a telephone pole. Once inside, your main interaction with the car is a through a large 10.25-inch central display and a 12.3-inch digital dash (both of which come as standard, and look great). While you’ve got the traditional BMW rotary click wheel to scroll through the menus, there’s now also an option for a gesture control. This allows you to control a few basic functions of the car by swirling your finger in the air in front of the centre console. For example, twirl it clockwise and and it’ll turn the volume up, point two fingers forward and it’ll pause your music. The volume control consistently works well (that’s the most useful function, as well), but other gestures are a bit more hit and miss. The 5 Series comes as standard with a SIM, meaning you have a Wi-Fi hotspot everywhere you go, and, when you’re away from the car you can check on your vehicle status and pre-condition the cabin before a journey. BMW has also introduced a cool feature which allows you to remotely check the 360-degree cameras (especially useful when you’re parked in a dodgy neighbourhood), and make sure no one’s trying to break in. Did we mention it’s semi-autonomous too? Of course it is! Copilot mode will help steer you within your lane and keep your speed constant, braking for other cars in front. It’ll even detect cars moving into your lane and swerve so you’re always safe. It’s a very strong system, working at speeds up to 130mph, almost as if there’s a halo around your car, but this might be a bit too intrusive for some. The new 5 Series’ design is clearly more evolution than revolution, it’s a beautiful looking car. The LED headlamps flow into the kidney grille, and it’s gained some more feminine curves (which is a good thing). It’s more aero dynamic too, with a low drag coefficient of 0.22Cd. The cabin is a lovely place to sit in. You feel lowdown, surrounded by soft leather and quality plastics. Let’s start buy going through the different engine options. First up there’s the base 520d model with 190hp, 0-62mph time of 7.5s and £35,970 starting price. Or go for the xDrive four wheel drive version that intelligently moves power between the wheels to help in corners, on ice and more for a £37,970 starting price. Then, there’s the 530d with 265hp and 0-62mph time of 5.7s at £43,780 or with xDrive a 5.4s 0-62mph time and £45,780 price. Or, if you want something a little fruiter, there’s a 540i xDrive with petrol engine that offers 340hp for a 0-62mph time of just 4.8s and price of £46,405. We drove the 530d, an must say, were very impressed. There’s plenty of torque on tap and the eight-speed ZF gearbox is silky smooth. It also handles incredibly well, managing to be both relaxing on a motorway slog, and dynamic and exciting on twisty roads. This is partly down to the electronic all-wheel drive steering set up, which increases manoeuvrability at slow speeds, and improves stability at higher speeds. It’s impossible not to be impressed by how capable the updated 5 Series is, it really is the car that can do everything. It’s prettier, faster, and more economical than the outgoing generation. But it’s the sheer amount of cool technology in this thing is which we love most - and the fact that this technology is now popping up in (slightly) more affordable cars. You want the best SUVs money can buy? We got 'em!